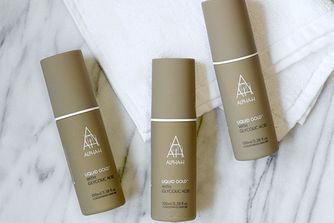 Liquid Gold is arguably the jewel in Alpha-H's well deserved crown - and now you can stock up on the ultimate skin care saviour, and save yourself over 25% of the ml-for-ml value! A silky night serum which is instantly absorbed by cell membranes, it restores a golden glow to even the most lack-lustre complexions. 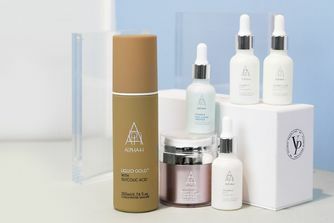 Revitalising and firming in just one application, this clear liquid helps tackle hyper-pigmentation, acne, fine lines and enlarged pores, reversing some of the tell tale signs of skin ageing and too much time in the sun - it's like having a facial whilst you slumber! 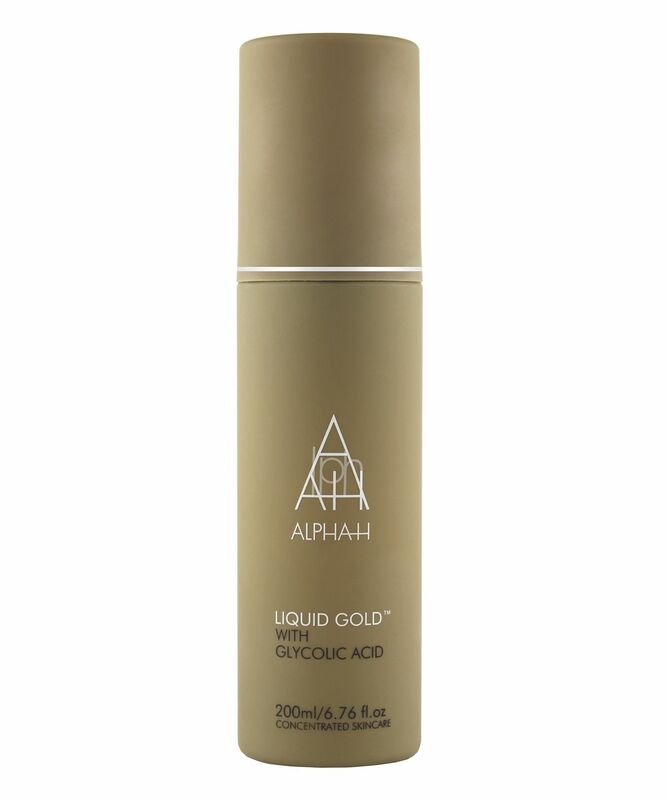 Alpha-H's beloved Liquid Gold just got super-sized - for over £18 less than its ml-for-ml worth! Excellent news for the die-hard fans for whom this is the nearest thing to elixir-of-youth. A powerful firming serum, this works like an 'overnight facial' to tighten and revitalise tired, ageing skin and radically improve the appearance of fine lines, wrinkles, open pores and acne prone skin conditions. Liquorice helps combat acne and hyper-pigmentation, whilst Glycolic Acid (derived from sugar cane), jump-starts the skin's metabolism - refining its texture by dissolving the bonds that hold dead skin cells together, so they're sloughed away with your morning cleanse to reveal a more luminous, glowing complexion. Love loveland more love ! It's a must buy. I didn't think I could get my skin looking this good after of a week using this product and it hydrates no moisturiser needed after applying it. And this is after me being ill and my skin looked horrible, with no luster, it was dull and I did loose collagen due to the medication I was taking. Love it! So I had recently had a peel oil done on my neck to treat my dermal hyperpigmentation. It didn't do anything! Anyway, I was going through a few products I had bought from Cult beauty which I forgot about and came across this and did some research about it too. Like it said on the packaging I started using it every other evening after my skin being cleansed without moisturiser. When I first applied the product it tingled a bit but it was fine afterwards and doing it for a week or so! I never thought my neck would be normal. The pigmentation started to get lighter and my neck started looking normal! For once! Finally! I am so happy with this even though it is taking a while for my pigmentation to go which is my own personal factor but kudos to this product. So if you have pigmentation definitely buy this product. 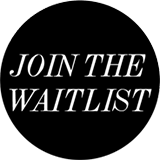 Of course you do have to consider for each skin type it may work differently, some might take longer whereas with others it would be much quicker! Why is there so much alcohol in this product. It was the first thing I noticed and I just don't like putting it on my face. It will eventually dry out your skin. I didn't see much when using this either. It’s a must buy. I have fallen in love with this product. I used to use it a couple of times a week at night as it’s very powerful and strong. It stings at first a tad bit but followed by moisturiser is fine. The product is great and has helped me with my face a lot. One of the only skincare products that you can actually see the results instantly the next morning! It’s been great for my acne scars, really brightens and tightens. Really simple and easy to use too. At first I was a bit scared to try acids because my skin is a little sensitive and I didn't want to increase the redness of my cheeks. However, I have 3 persistent dark spots that even with dermatological treatment never disappear, and with an increase in darkness I decided to give this product a try. It really is an excellent product. The improvement in my skin was really impressive, not only in terms of my dark spots but also the texture and added glow. 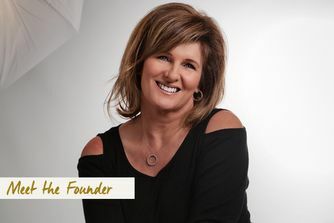 In my case I have never found a product so effective, it really is a game changer. I am male, and acne runs in the family. Even now, at the tender age of 41, I still get acne outbreaks. Less face, more the back and the upper arms. I used to experiment with highly concentrated AHA-A and AHA-B acids, which was way much cheaper and produced good results, but also left my skin in a condition that I wouldn't have dared to leave the house for a couple of days. This product contains the most banal glycolic acid at 5% concentration, but it really feels different. I don't know if it's the hydrolized silk or liquorice, but when I apply it overnight, I know I will not have to walk to work the next day red-faced and with chemical burns on my skin. I find it a bit pricey, if you buy the small size. I used to buy two bottles for the price of one (of course, it was a few euros more expensive), but the double size is the same value. I would still prefer to have two bottles, because one remains unopened when you start using the other. Just bought this for my sister, it was me who recommended it to her. Being male, I feel quite proud to recommend something for women. Has made a huge difference in the overall radiance and tone of my skin. Using a gentle cleanser, this as an acid toner, and finishing with Sunday Riley Luna keeps my skin looking at least 15 years younger than its actual age. Ok, thank you Mom, for some good DNA, but I couldn't give it its due without some Alpha H! I use this 2-3 times a week, and always see a difference the next morning. I have acne prone skin, and this is brilliant for taking down spots. My skin looks clearer since using this, so I will definitely be re-purchasing when I finish my bottle. I love this product. I have oil combination skin, which is weirdly sensitive to a lot of cosmetic products. This usually makes battling breakouts extra difficult. So Alpha H Liquid Gold was a game changer for me. I use it overnight whenever I get breakouts or just need to refresh my complexion and it literally transforms my skin. Nothing nicer than waking up with all the skin problems gone or significantly diminished. My mother also loves this product, even though she uses it to battle completely different issues. Either way, while it has a different effect on her skin, it seems to be working brilliantly for her too. I love love, love this product! It has done absolute wonders for my 52 year old skin; hyperpigmentation, gone, enlarged pores, gone, blemishes and fine lines, gone, gone gone. Everyone tells me I look ten years younger. I now order a new bottle when I'm only halfway through as I have developed a real horror of being without this. I must say, though, that I was not impressed by its sister product - to be used on alternate nights - it's a total waste of money. But this? Buy it. If you can afford nothing else, buy this. And always use with a hot cloth wash prior to application. The result? Incredibly beautiful, soft, radiant skin! I have sensitive skin with rosy cheeks, drier skin around my eyes and a slightly oily t-zone. Although rosacea sufferers are recommended to use PHAs rather than AHAs and BHAs, I started off using this one a fortnight and worked my way up to daily. At the beginning I found it so strong that I used it once a month! I then increased my tolerance to it and now use it just once a week. With this product I notice a difference the very next day! I would also recommend allowing the product to dry before finishing by layering a hydrating serum or moisturiser. In fact, I find my rosy-red skin is happiest when I combine my acids with creams which reduces the reaction. If you have rosacea do try acids but go slow! I've been using this product for over two months now and it's simply amazing. It really helps with skin tone, exfoliating and treating sun damage. It leaves your skin feeling super soft and brightens your complexion completely. I could not be happier with this product. I believe it does magical things for the right skin type, but when I tried the sample with a cotton pad, I immediately felt it’s too strong for my sensitive skin. I just don’t think it’s comfortable to have a daily routine with a product that’s too heavy and tingly on the skin. Maybe it works on my skin if I use it twice-a-week. But at the moment Omorovicza Omoressence watery toner is much better for my skin, so I continue with that and recommend it to those, who feel Alpha-H Gold is too strong. And yes I agree, it would be really helpful if the acid amount would be mentioned here or on the package. Holy grail product. Got rid of 80% of my cystic acne. Since the frequency of my acne lowered and the size too. I still get them, but this definitely helped so much. Invest in this product. I was reluctant to try this out this on my skin even after reading all the amazing reviews and even after buying the product. It sat on my dresser for about a week before I gave it ago, the thought of putting a type of acid on my extremely sensitive dry and acne prone and acne scarred skin petrified me a little to say the least. However from that very first application the difference was absolutely outstanding and I can honestly say "I'm hooked". I use it every other night without moisturising afterwards, to only find my skin literally glow in the morning, For the first time in years I am comfortable and happy to go out without any make up on and still get comments on how good my skin looks. I have been able to go makeup free and can hand on heart say that the morning glow has continued well into my 3rd bottle - I can see why this product is a cult one. Never change this product. I bought this product thanks to Caroline Hirons and, MY GOD SHE WAS RIGHT. I know this is more of a treatment than an acid toner so I do only use it every second day, but for me, the results have been even better than some pricier products: zero breakouts, softer skin, more even skin tone. Two weeks in and I know this would be a staple in my skincare for years to come. Word of advice, I have oily/acne prone skin which is also very though and can handle most acids and prescription retinols and I do need to use a good face oil and moisturizer so use with caution if you have more sensitive skin. I can't quite believe how much I love this product. I was initially reluctant to buy it as it's a little pricey but wow the difference it has made to my skin makes it worth every penny. My skin is clearer, brighter and my acnes cars are fading for the first time ever. Takes a bit of time to see the results but it's worth the wait. I admit that I sometimes forget to use it because it's meant to be used every other night. This famous cult product lived up to expectations! This is my second bottle, it's easy to use, effective and gets results. Easy to add to your nightly routine every second night and follow with an oil or moisturizer if I need some hydration otherwise I just finish with the Liquid Gold for a stronger treatment. The price point is also excellent considering how long it lasts. Cannot record this enough! I use it every other night, just a light coat all over the face and it truly is magical! I will definitely be repurchasing this again. This was one of the first products on our original list when Jess and I were starting Cult Beauty. Everyone I've ever recommended it to has adored Liquid Gold; for acne, for hyperpigmentation, for general blemishes, for fine lines, for dull skin. This product redresses all of the main problems people have with their skin, without a luxe price tag. And now it comes super-sized as well as supercharged.